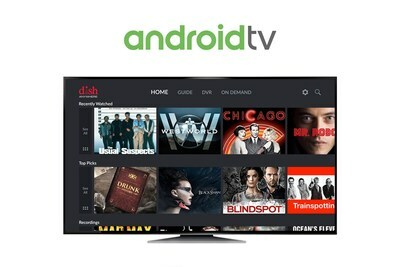 ENGLEWOOD, Colo., May 2, 2018 /PRNewswire/ -- DISH today announced that its DISH Anywhere app is now available on Android TV™ devices, bringing more choice and flexibility to how customers watch video content on their big screens. While DISH Anywhere has been available on Android mobile devices since 2013, customers can now use Android TV media players and smart TVs for the first time to access their DISH programming, either at home or on the go. DISH Anywhere gives Hopper customers the ability to watch 100 percent of their live and recorded content, plus thousands of on-demand titles, from any location on internet-connected mobile devices, including smart phones, tablets and computers, and televisions via Amazon Fire TV and now Android TV. "Media players provide easy access to video content, so it's no wonder one-third of U.S. broadband households own these devices," said Niraj Desai, DISH vice president of product management. "By expanding the DISH Anywhere app to Android TV, we're giving our customers more ways to view their content on devices they already own, at no additional cost." DISH Anywhere can be accessed on Android TV devices, including media players like AirTV Player, Mi Box and NVIDIA Shield TV, and Sharp Aquos and Sony Bravia smart TVs. It's also available on DISH's EVOLVE set-back box for hotels, so customers can view their personal live and recorded DISH programming directly on their hotel room TV. The following DISH set-top boxes give customers access to live, recorded and on-demand content on DISH Anywhere: Hopper 3, Hopper with Sling, and first-generation Hopper or compatible ViP receivers connected to a Sling Adapter. All DISH customers may use DISH Anywhere to watch on-demand titles. To watch DISH Anywhere on Android TV, download the free app from the Google Play Store. DISH Network Corporation is a connectivity company. Since 1980, DISH has served as the disruptive force in the pay-TV industry, driving innovation and value on behalf of consumers. Through its subsidiaries, the company provides television entertainment and award-winning technology to millions of customers with its satellite DISH TV and streaming Sling TV services. DISH operates a national in-home installation workforce, as well as an advertising sales group delivering targeted advertising solutions on DISH TV and Sling TV. In addition to its TV services, DISH has commenced buildout of a nationwide narrowband "Internet of Things" network that will apply capacity from its strategic spectrum portfolio. DISH Network Corporation (NASDAQ: DISH) is a Fortune 200 company. Android TV, Google Play and the Google Play logo are trademarks of Google LLC.